David Martinez is an American singer/songwriter who had music all around him when he was young. Music was all around the house, whether it be my dad playing Kiss, Grand Funk records or my mom playing Wings and Elvis records. I remember that vividly and one of the fondest memories was sitting around with my grandmother and listening to Elvis. She loved him, he tells us. What would he do if he wasn’t doing music? I’m a school teacher, I actually went to college first and got a Bachelors and Masters before I took the whole music thing seriously. I was going to work on my Phd but I knew that would prolong my desire to play music at a professional level. I’m glad I chose music because now I feel I’m on the right track and I love the idea of learning new things all the time. It started very early for David. My Dad was the guy who showed me all kinds of music and told me he’d love to see me on stage. He never pushed it on me but at the same time he didn’t need to, I was musically obsessed by the age of 2, he continues. But not only parents are an inspiration to artists. There are a lot of musicians who inspired David, like Mick Jagger, Keith Richards, Jim Morrison, Slash, Eddie Vedder, Paul McCartney, Ted Nugent, Ace Frehley, Axl Rose, Chris Cornell, Jimi Hendrix, Jimmy Page, Robert Plant, Chris and Rich Robinson, Tom Petty, David Bowie and the list goes on. Not only musicians on the list. Other non-musical influences for him are Robert De Niro, Johnny Depp, John Travolta, George Lucas and Harvey Keitel. In 2008 the “The David Martinez Band” was formed. The band consists of Damian Diaz (bass), Jose Garza (rhythm and lead guitars) and Johnny Ramos (drums and percussion). David explains how the band came together. I put the first lineup together in 2008 after I recorded the first record. I had trouble finding a solid drummer then I got a call from Johnny. He answered an ad I posted at Guitar Center, I remember posting it because I was frustrated. This drummer I had talked to was suppose to show but decided to go to the beach. Johnny has been with me since then. There were some tensions with others as they weren’t on the same page as Johnny and me. We had some fill ins, but finally found two new members (Damian and Jose) with the same vision. Then he continues to talk about the reason they work so good together. The love of music and one thing you would think is that we all have common interests but our backgrounds are so different. This helps keep the ideas fresh. The band has performed their first show on December 19th, 2012 with the new line up and they are going to perform more live show as a band. David gives his point of view on the difference between his group and solo work. I would love to record with my current lineup given that the budget is available and we have the right people to work on the album. My solo work is a little more intimate and raw compared to how we take it to another level with the band. This group of musicians I have are super talented and creative and they help me reach the vision I see these songs going. He plays the newer songs that he has written solo. I do write my own songs and have been doing so for a long time now. I wrote all the songs on my first record except one which I co wrote with Leroy Miller (producer). On the new record I wrote all the songs except Blue Sky, which Leroy Miller wrote. Leroy contributed some ideas to the others songs and I gave him credit, David makes clear. My band joked with me calling my song catalog sort of a diary of my love life. My songs have a lot to do with love and relationships but on the new album I touched on subjects such as traveling home, Hollywood, to soul searching, he continues, giving an insight to his songs. In 2009 David brought out his first, self-titled, record. 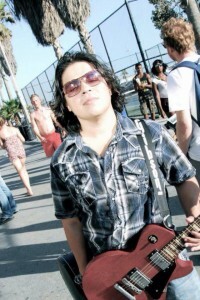 I have a self titled record which I recorded in 2007 in Hollywood, California with Leroy Miller producing. We have great players such as drummer Kane McGee (Northstar Session) and keyboardist Adam Macdougall (Black Crowes) play on the record. Leroy also played on the record too. It took about a year and a half because I wanted to get a solid lineup together and my radio campaign started in January. It is available on iTunes, Amazon, CDBaby, etc, he tells about it. David continues: The response to the album was great and got great reviews. There are people who write me all the time and tell me how this album has changed their lives. It’s pretty humbling. He also gives his opinion on the record industry of today: My opinion of the recording industry today is the way I look at a drug addict looking for a quick fix. There is no more developing of artist, there is the creating of artists. You really think Lady Gaga was Lady Gaga before the industry got a hold of her. The industry used to let artists develop and flourish and that’s what made them great and I was forever inspired. These days you get bands that really don’t match up to the likes of The Stones or Led Zeppelin. And how does David distribute his music? CD Baby distributes my music to iTunes, Amazon, Rhapsody, Spotify and other online retailers. I do have a couple of local indie music stores who sell my album. At the moment David is only gigging around the United States, but there are plans to conquer more of the world. I only do US gigs at the moment but Ladylake Music has been pushing my music in the UK and we are starting to expand to Europe. The goal is to get overseas by 2014, I know it’s an absolute possibility, he informs us. David also entrusts us with his most embarrassing experience. Back when I was in college, all the instruments were out of tune and me and a friend went on stage(Open Mic) with a drummer and bassist sitting in. It was a complete disaster, I came to a conclusion that rehearsal and planning was essential. The next move for David Martinez is a tour on the East Coast and start working on a new album at the end of the year. It would be exciting to one day perform in the Hollywood Bowl and for many sold out crowds. 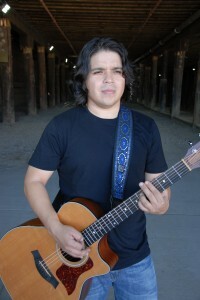 Find out more about David Martinez their music here.